Micromax is another desi brand, which brings good range of budget LED TVs in India and with Make in India campaign gaining hysteria, Micromax would consolidate its position in LED TVs segment. Its being some years now for Micromax since it forayed into LED TV segment since its setup of Rudrapur factory. 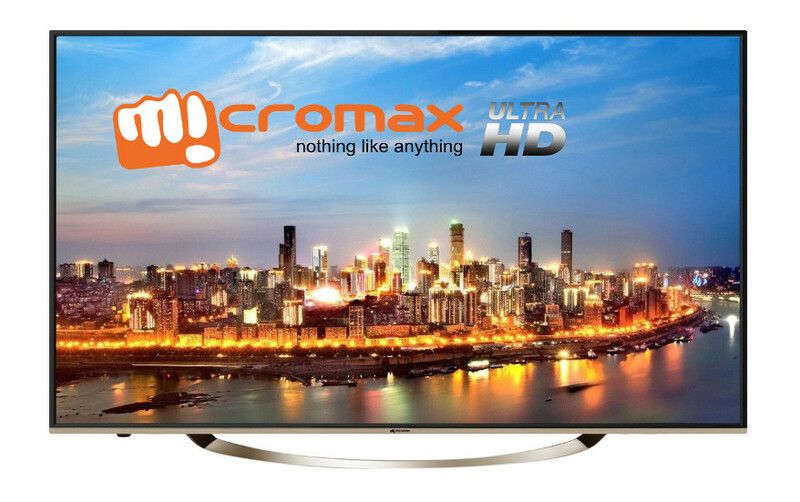 Sighting the rise of 4Ks or UHDs, Micromax has decided to embark on the mission of coming up with budget 4K TV. And the result is it new UHD line-up which is undercutting the competition, by providing seemingly luxurious 4K TVs at the fraction of price to what premium brands like Samsung, Sony or LG offer. When it comes to features to prices ratio, it even betters the like of Vu, another fast-growing LED TV brand. The premium range of Micromax’s LED TVs offers stunning 4K entertainment by hosting a mammoth 3840×2160 resolution. This makes picture look bright, beautiful and life like; thus making TV viewing a palatial experience. Image clarity offered owing to its high resolution is exceedingly good with no apparent pixelization. So, when the user plays adrenaline-charged action game or watches a sci-fi thriller, the high-contrast UHD 4K Display by Micromax will allow them to see and enjoy the extraordinary depth and detailing of the pictures. It also offers wide viewing angle of 178 degrees so watching TV from sides or tilted position shouldn’t be an issue. Premium models of Micromax LED TVs come with slim bezels of size 0.78cm. This gives it razor thin form factor. Its 49’ UHD TV comes with golden metal frame—design which would appear eccentric to many while gaudy to few. Also, glass backpanel gives it a sleeker and elegant look. Despite being budget appliance, its finish is decent, which would catch the attention of the visitors. Stands are far spaced meaning users will need a wider table or wall mount. On the connectivity front, there are lot of ports like HDMI, Ethernet, VGA, RCA, USB (even 3.0), SD card etc so users would not lose out on connectivity features on high end Micromax TV. Not to mention, Wi-Fi option is present for smart LED TVs. Another interesting feature of Micromax TV is that users can convert their UHD TV into WiFi hotspot through its LAN cable. Also, it has Miracast technology which allows mirroring; it not only lets you can share media files from smartphone or tablet to TV but also capture TV screen on the smartphone for an uninterrupted viewing. It also allows TV to be controlled using smartphone with its Wireless Smartphone Control feature. UHD TVs from Micromax are decked with Box speakers which are designed to provide heavy bass and clear sound at any volume. It also hosts 5 band equalizer giving users the option to customize the sound based on their mood. Digital Surround Technology in its speakers give lively sound and sharp treble so users can enjoy, cherishing the crescendo of their favorite songs. Also using SRS sound system which enhances the sound with more depth and clarity users can enjoy seamless musical experience. It also has noise reduction capability which filters out any unnecessary sounds and disturbances. UHD LEDs are powered with dual-core CPU and quad-core GPU to make the most out of entertainment by minimizing lags and enhancing the visuals. Since the UHD TVs support SD card slot, memory of the TV can be expanded beyond what is offered out of the box. Despite of its “ultra high” definition, Micromax tries to keep power consumption low. Its active power consumption is 120 watts while standby power consumption is meagre 1 watt. It also provides with Energy Saving mode to cut down electricity consumption—boon for those who are keen for saving power. 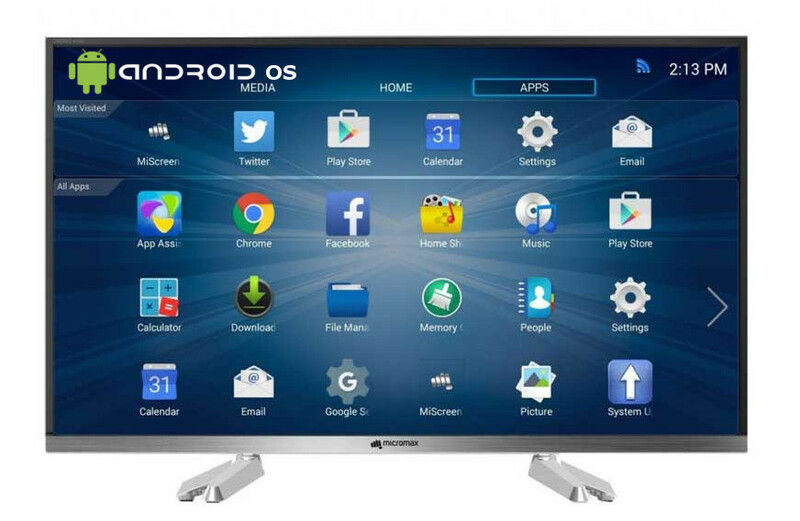 Micromax uses Android as its choice for TV OS when it comes to its premium range Smart TVs. Now, Android like in smartphones, is aiming to gain leadership in Smart TV OS market. Even premium manufacturers like Sony are using Android OS in their Smart TVs. But to be fair, Android is pretty much work in progress, with couple of features in beta (and testing) stage. Android OS gives the user power to access their favourite apps especially social media ones directly on TV. Choice of Android seems to be a smart move by Micromax, as it is considerably future proof; for Google is working heavily on this project and its bound to get couple feature enhancements and upgrades. TVs are marketed using different specs and one of the lesser known parameters is refresh rate. Refresh rate is how frequently a TV switches the image (alternatively called, “frame”) on screen. With traditional televisions, this was 60 Hz or in layman’s lexicon—60 times each second. Micromax’s UHD TVs have a refresh rate of 60 hertz. Refresh rate matters the most while watching fast paced program like an action-packed live sports event or a fast action thriller movie. So, given that even manufacturers like Vu are offering 120 hertz, refresh rate offered by Micromax is on a lower side. Comparing to competitors, Micromax don’t have much to boast with its rudimentary but simple features. Its main advantage is that it provides advanced TV features like Smart TV and UHD at an affordable price. Also for its high-end models, it provides lots of connectivity options in the form of ports and slots like HDMI, Ethernet, VGA, USB, SD etc. So, this means Micromax’s LEDs bigger screen can be used for tablet-like functionality. Another good thing about Micromax is its remote—a fairly simple and well-designed, which comes with motion controlled capability. Also, native UHD pictures are relatively clear considering its price with no apparent pixelization. And finally, the biggest plus is its shipped with Android for its premium range which means users will get a popular and renown system with good number of apps thanks to Play Store marketplace. Given this is budget brand you must be ready to bear couple of shortcomings. Design is bit flashy for models like 50K2330UHD, which might seem bit gaudy. The main problem with Micromax’s TVs are its low refresh rate—just 60 Hz which is the standard source rate and given its UHD nature this doesn’t justify its rich resolution. Also, with no OLEDs or QLEDs black levels are average at best, with other colors appearing brighter than usual. Also, Micromax needs to work on the area of upscaling where pictures and videos don’t appear good when sourced from lower resolution devices like smartphone or tablet. After testing waters with smartphones, Micromax forayed into TVs market in 2012. Couple of years back it took a futuristic move by bringing its UHD LED TVs sighting competition from another Indian brand: Vu. Micromax TVs does a decent job in streaming native UHD or HD. So, its sheer size, irregular looks, Android-based UI with decent picture quality makes Micromax a good value-for-money option.